Aggrieved customers of Menzgold Ghana whose investments have been locked up in the company have now turned to President Nana Addo Dankwa Akufo-Addo and other state institutions to help them retrieve their fortunes. About 1.8 million customers are frustrated about the inability of the company to pay back their invested capital. The two-hour demonstration started from the Obra Spot at the Kwame Nkrumah Interchange about 9:30 a.m., from where the demonstrators walked to Farisco on the Ferrar Avenue and headed towards the Trades Union Congress (TUC) area before converging on the Accra Hearts of Oak Park, where they presented petitions to the President, the Bank of Ghana (BoG), Parliament and the Security and Exchanges Commission (SEC). 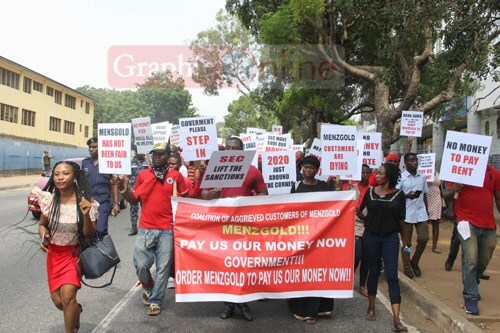 During the orderly and peaceful walk, the demonstrators sang patriotic songs and hurled invectives at the Chief Executive Officer (CEO) of Menzgold, Nana Appiah Mensah, and the management of the company. Some of the demonstrators who spoke to the Daily Graphic stressed that they would stop at nothing to ensure that they got their investments back. The organiser of the demonstration, Mr Denis Brown Atisu, for instance, said yesterday’s demonstration was just a tip of the iceberg, as the aggrieved customers would continue to embark on a number of lawful actions to retrieve their investments. “Today we have people from the Western, Central, Brong Ahafo, Ashanti and other parts of the country joining in this demonstration. I want to state that until we get our money, we will continue to act. “I personally invested GH¢100,000 in the last six months and I cannot sit idly for my money to go down the drain. We want the Bank of Ghana, the President, Parliament and all who matter to act for us because we are only investors and so if the entity we entrusted our investment is not operating legally, it is not enough to just shut its operations without helping us to retrieve our money,” he said. Dr Benjamin Amoah, the Advisor to the Governor of the Bank of Ghana, received the petition on behalf of the Governor, with an assurance to the demonstrators that the central bank, in collaboration with other state agencies, would take the necessary steps to address the issue. A Deputy Director of Human Resource at the Ministry of Information, Mr Kofi Ohene Benning, representing the Minister of Information, Mr Kojo Oppong Nkrumah, received the petition on behalf of the President. He assured the aggrieved customers that the petition would be handed over to the minister for onward submission to the President. A copy of the petition made available to the Daily Graphic appealed to the President, Parliament and other high-profile state institutions to act swiftly to ensure that Menzgold Ghana paid all its customers their principal investment in full within three months. “We want Menzgold to come up with the proper payment schedule that clearly shows when payments will be effected to customers throughout the 90-day period. “We also demand the CEO of Menzgold be ordered, under your authority, to pay us our hard-earned investments,” it added. 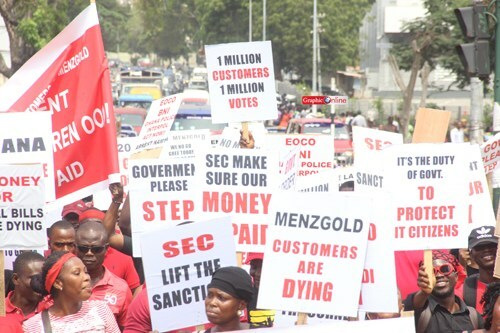 The customers said they had lost confidence in Menzgold Ghana’s commitment to pay their investments because the company failed to fulfill an agreement that been reached after two crunch stakeholder meetings. They said the first meeting was held on October 7, 2018, at which the company and the customers agreed that there would be no payments for extra values to them but that they would be paid back their primary values of gold traded with the company. According to the petition, the company agreed and proposed to return to every customer the full value of gold traded within 90 days, commencing from October 9, this year. At the third capital market conference and 20th anniversary commemoration of the Securities and Exchange Commission (SEC) on Wednesday, November 21, 2018, the Minister of Finance, Mr Ken Ofori-Atta, made it clear that the government was not under any legal obligation to pay persons whose money had been locked up in Menzgold. Attributing the decision of people to invest in the company to pure greed, Mr Ofori-Atta said some of the affected persons were members of staff of the Bank of Ghana (BoG), the Ministry of Finance, the military and other reputable institutions across the country. Mr Ofori-Atta said the company had no licence from requisite state bodies to operate. He said much as the issue was disturbing, the government was not obligated to investors of the gold dealership, which was offering as much as 120 per cent profit per annum. The Securities and Exchange Commission (SEC), on September 12, 2018, directed Menzgold Ghana Limited to shut down its investment operations with immediate effect for contravening the Securities Industry Act, 2016 (Act 929). According to a letter addressed to the Menzgold CEO, Nana Appiah Mensah, investigations conducted by the regulator found that Menzgold’s business, which involved the purchase/deposit of gold by the public and contracts issued with guaranteed returns with clients, was a capital market activity which could not be conducted without a valid licence issued by the SEC.